The Camp Davies 2019 Fall Harvest Session program is currently sold out. Please contact our Camp Director, Matthew Levy, to be placed on the waitlist. He can be reached at mlevy@schramsberg.com or at 707-942-2408. 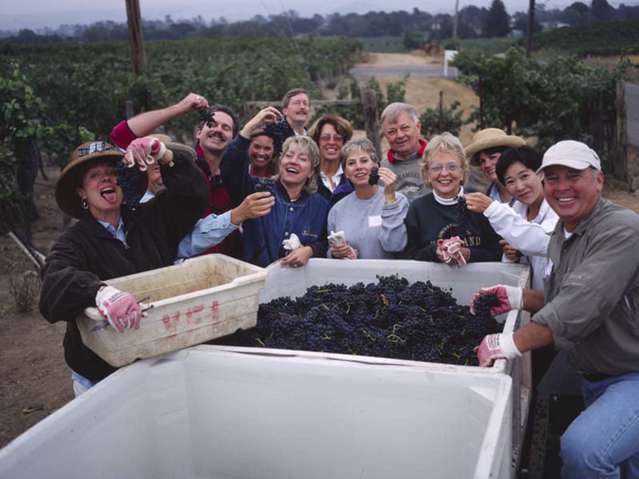 Fall harvest in the Napa Valley is an extraordinary time. The Valley is buzzing with activity and the perfume of crush is in the air. The Camp Davies 3-day harvest experience brings you into the action for an experience you will treasure for a lifetime. Camp Schramsberg is the ultimate experience for food, still wine and sparkling wine lovers! Camper Tuition: $1,450 per person (Club member discount applies). There is an additional charge of $145 for the optional Monday evening library wine dinner. Transportation and lodging are not included. For more information, please email Camp Director Matthew Levy at camp@schramsberg.com or call 800-877-3623 x2408.